The Annual Guild Stash Sale takes place June 4, 2019. 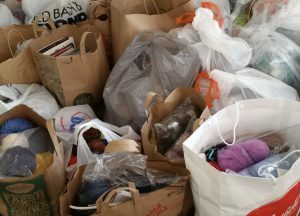 We are accepting donations of anything knitting related–yarn, tools and equipment, finished objects (please suggest a price), unfinished objects, project bags, patterns, books (not magazines), etc. Please keep multiple skeins together when donating to make sorting easier. Magazines can be brought to the guild meetings for the “freebie” table. We are collecting at all meetings through the May 2019 meeting. Volunteers are needed to help with preparations before the sale and at the sale. Please contact Stash Sale Coordinator Lou Wanna Katz StashSale@sandiegoknitters.com and let me know you can help! I live off I-5 and Leucadia Blvd if you would rather arrange a drop off. Contact me at the above! « Space Still available in two Cecelia Campochiaro’s Classes.